"An umbrella network of Kurdish organizations that includes the outlawed Kurdistan Workers’ Party (PKK) has announced a three-year-long cease-fire agreement with Ankara is now over, dealing a major blow to a protracted reconciliation process with Turkey's Kurds." Since 1984, nearly 40,000 people have been killed in clashes with the PKK, which is designated as a "terrorist organization" by the international community, including the United States and the European Union. The PKK launched a three-decade-long self-rule insurgency in 1984. It tempered its aims subsequently and its imprisoned leader Abdullah Öcalan has been negotiating a resolution to the conflict. But in recent months the process has stalled with positions hardening on both sides. Kurdish anger has been boiling since the Turkish government refused to intervene militarily to help the Syrian Kurdish defenders of the border town of Kobani to see off a months-long siege by Islamic extremists. During the siege, which was lifted in January partly as a result of fierce U.S.-led coalition airstrikes on the extremists, Turkish jets launched air raids on PKK positions in southeast Turkey. The main Syrian Kurdish group is an offshoot of the PKK. Further anger was prompted last month when the Turkish President warned he would not allow the Syrian Kurds to create a state of their own along the border with Turkey. And clashes between the PKK and the Turkish military have increased in the southeast of the country, with both sides accusing the other of prompting the fights. The peace process with the Kurds is one of the main initiatives of President Tayyip Erdogan's decade in power, during which Turkey has enjoyed an economic boom underpinned by investor confidence in future stability. The sentiments of frustration and deep anger contained in the weekend statement reflect the ire of many of the country’s 12 million Kurds towards Ankara. The PKK-linked Kurdish Communities Union (KCK) declared an “end to the cease-fire” first agreed in 2012 and warned it would target "all the dams” in the country’s southeast. In the statement delivering a significant setback to the fragile off-and-on peace process, the KCK said Turkey's building of barracks, dams, and roads for military purposes had violated the truce. "The Turkish State took advantage of the cease-fire conditions, not for a democratic political resolution, but to gain an advantageous position in preparation of war by building dozens of guard posts, roads for military purposes and dams in order for a cultural genocide," the statement said. In March, the country’s president, Recep Tayyip Erdogan, dismissed the idea there is even a Kurdish problem, prompting fears that talk of a breakthrough by his ministers was misplaced. Erdogan argued Kurds already enjoy equal rights with the rest of the country and should not need anything else. The plight of the Syrian Kurds in Kobani provoked riots among Turkey's 15 million Kurds. Opposition politicians tied his nationalist dismissal of the Kurds to the June parliamentary elections. His ruling Justice and Development Party (AKP) lost its majority in the polls and is now immersed in coalition talks, with the most likely partner being the right-wing Nationalist Movement Party (MHP), which wants to see an end to the peace process. Pro-Kurdish lawmaker Altan Tan accused the government of paving the way for a collapse of the peace process by acting slowly and dragging its feet in the talks. "Those who want a [peace] resolution have to act swiftly to avert a rekindling of the insurgency", he says. He accused the PKK of reneging on a pledge to withdraw armed fighters from Turkish territory. The rise of nationalist parties in Turkey's recent elections and developments in the broader Kurdish geo-politics of the Middle East illustrate that nationalism as a political, ideological, and sentimental framework is regaining steam. An independent Kurdistan has been a dream for the region's Kurds for decades. Twenty five percent of Turkey’s population is Kurdish, and Erdogan—like most of his ethnic Turkish countrymen—are terrified that Turkey may lose a huge swath of its territory if Syrian Kurdistan liberates itself alongside Iraqi Kurdistan. Turkish Kurdistan could very well be the next domino. Turkey has a world-class army—the second-largest in NATO—and could obliterate ISIS from the face of the earth if it wanted. If Syria’s Kurds can make headway into ISIS-held territory with just a ragtag militia, Turkey could liberate the Syrian population from Bashar al-Assad, Hezbollah, and ISIS simultaneously. Kurds are often regarded as "the largest ethnic group without a state", although larger stateless nations exist. Kurds have a special deal in Iraq that they have nowhere else in the world: territory they actually govern semi-autonomously from the central Iraqi government. Iraqi Kurdistan is defined as the three provinces — Dohuk, Erbil, and Sulaymaniyah — and the Kurds' fight against ISIL both in Iraq and Syria is also creating the Kurdish public sphere as a community of shared emotions and sentiments. The US cares so much about protecting Kurdistan because US is bombing the Islamic State (ISIS) in Iraq with a campaign narrowly targeted (?) to support the Kurdish military, or peshmerga.....but the point is that the Kurds aren't totally united. And neither is their government, or their military. The government of Iran has never employed the same level of brutality against its own Kurds like Turkey or Iraq, but it has always been implacably opposed to any suggestion of Kurdish separatism. The most populous Kurdish community is in Turkey — about 13 million. There's between seven or eight million in Iran, about five million in Iraq, and somewhere between 2 and 2.5 million in Syria. And none of these countries want an independent Kurdish state but now they have territory, oil and the friendship of the government of the United States because kurds are by far the most effective force fighting ISIS in both Iraq and Syria. Massoud Barzani, who leads the Kurdistan Regional Government, has repeatedly said Kurds will not fight for the rest of Iraq, or for the idea of it. Since the US intervention, the peshmerga have retaken some of the towns ISIS had seized. It's possible ISIS will hold onto the territory they've taken, but on-the-ground reports make it sound as if the momentum is flipping to the Kurds. Human Rights Watch documented instances of Kurds confining Sunni Arabs to specific areas to prevent their return, actions undermine the attempts by the U.S. and Baghdad to lure Iraq’s Sunni Arabs away from the orbit of ISIS and back into Iraq’s national enterprise. The maddening paradox is that the situation grows more difficult to manage with every gain against ISIS, the shared enemy: “Iraqi Kurds are using U.S. airstrikes and the political vacuum in northern Iraq not only to push back ISIS, but also to recapture disputed territories and oil fields—some of the very measures that have fueled Sunni Arab resentment since 2003.” Said Denise Natali, a senior research fellow at National Defense University in Washington. A substantial percentage of the Middle East’s Sunni Arabs see ISIS as the only thing standing between them and Iranian overlordship and If ISIS can keep the Kurds down, Turkey’s territorial integrity is more secure. ....But Diplomats and heads of state are often to last to notice tectonic geopolitical shifts. They’ve spent years, even decades, forming relationships with their foreign counterparts. but it’s becoming clearer by the year that Turkey’s membership in NATO is a vestige of an era that expired a long time ago. If Isis is the monster that Nostradamus predicted the Kurds must be defeated as the new allies of the United States ( the Syrian-Iranian-Hezbollah axis) . IRAN, THE ISLAMIC ESCHATOLOGY & THE CHOSEN ONE. "The Guided One"or the Hidden Imam. Requirements. + Emmanuel Sivan spends many pages describing and analyzing the Shiite vision of an “ideal, legitimate state to be instituted by its leader, the Hidden Imam.” Over the course of history, he writes, a “minority of Shi’ites, quite substantial and dangerous at times, would move from pessimistic idealism to an optimistic brand of the same approach—the imam’s arrival is imminent, God’s kingdom is bound to be brought upon earth by this messiah (mahdi), and one should help precipitate its descent by armed revolt.”. He warned that an integral part of Shi’a Islam’s belief and thought involves the initiating of a planetary conflagration. The circumstances of that reappearance could, in the hands of Iran’s mad mullahs, visit upon the world calamities of a scale never before seen. And Israel and America will bear the brunt. + Recently Iran's former hard-line President Mahmud Ahmadinejad has reportedly said that the United States is working to arrest the Hidden Imam, who according to Shiite belief went into hiding in the 10th century and will reappear to bring justice to Earth ( according to a transcript posted on June 21 on the website Dolatebahar.com, which is run by his supporters). Ahmadinejad suggested that the West -- and particularly the United States -- sees the return of the Hidden Imam as a threat to its "empire," adding that the U.S. administration is "evil." "It is really a government established by Satan to prevent reaching God and the Hidden Imam," Ahmadinejad was quoted as saying. " … This evil government knows that its end will come if the Hidden Imam reappears." He reportedly acknowledged that "some in Iran laugh about these comments." 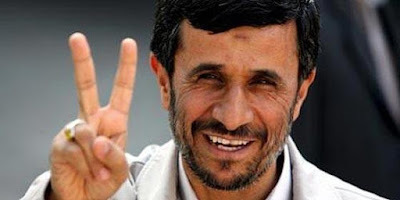 Iranian Ex-President Mahmud Ahmadinejad is well known for his devotion to the Hidden Imam. According to the traditions of Twelver Shi’ism, the official religion of the Islamic Republic of Iran, the twelfth of these Imams, a boy of five years old, disappeared under mysterious and disputed circumstances in the year 874 – but remained alive.” , promising to return when the time would be propitious. The Mahdi’s arrival has been eagerly anticipated and rumor has it that Iran’s former president, Mahmoud Ahmadinejad—like Supreme Leader Ali Khamenei, a fervent believer in the Mahdi’s parousia—widened a boulevard in Tehran to welcome the savior with public celebrations. This may be a canard, but even were it the case, Ahmadinejad need not have bothered. That was yesterday; today is a new beginning. + The Shiite like many Christians, lives in a world full of signs of the impending concluding chapters of history. This is vitally important in understanding Shi'a culture and political theory. Most of Iranian history can only be understood in relationship to the Doctrine of Return and the prophecies associated with it. For instance, during the Iranian Revolution, several Iranians believed that Ayatullah Ruhollah Khumayni, the spiritual and theoretical head of the Revolution, was the Hidden Imam or Mahdi returned to the world of humanity. While Khumayni never admitted this, he never denied it either. In many ways, the Revolutionaries believed that they were engineering or inaugurating the beginning of the reign of justice in the world, just as the radical Protestant English who settled America believed that they were inaugurating the one thousand year rule of saints that would precede the end of the world. Contemporary Iranian politics can in no way be divorced from the fundamental religious tenets of Shi'a Islam. Sunni and Shi'ite Islam have different beliefs on the identity of Mahdi. Historically, Sunni Islam has derived religious authority from the caliphate, who was in turn appointed by the companions of Muhammad at his death. The Sunnis view the Mahdi as the successor of Mohammad, the Mahdi is expected to arrive to rule the world and reestablish righteousness. Various Sunnis also share a parallel belief that though there may be no actual Mahdi, the existence of mujaddid will instead lead the Islamic revolution of a renewal in faith and avoidance of deviation from God’s path. Such an intellectual and spiritual figure of Sunni tradition has been attributed to numerous Muslims at the end of each Muslim century from the origin of Islam through present day. This classical interpretation is favored by Sunni scholars like Ghazali and Ibn Taymiyyah. Shi'a Islam, in distinction, followed the bloodline of Muhammad, favoring his cousin and son by marriage, Ali. Ali was appointed the first Imam, and following him there were eleven more. Muhammad al-Mahdi, otherwise known as the twelfth imam, went into hiding in 873/4 AD at the age of four. His father was Hasan al-`Askari, and had been murdered, and so he was hidden from the authorities of the Abbasid Caliphate. He maintained contact with his followers until 940 AD, when he was hidden. According to Islamic tradition, the dispute between the majority Sunnis and the Shiat Ali (Party of Ali) began upon the death of Muhammad in 632. The Sunnis contended that the prophet of Islam had made no provision for a successor as political, military, and spiritual leader of the Muslim community, and that therefore the Muslims should choose the best man among them as their leader. The nascent Party of Ali, on the contrary, claimed that Muhammad had designated his son-in-law Ali ibn Abi Talib as his successor, and that the successor of Muhammad had to be a member of the prophet’s household. Ali was finally chosen as the fourth caliph in 656, but in 661 was assassinated. Hassan, his eldest son (and successor, as far as the Shi’ites are concerned), was murdered in 670 on the orders of the Sunni caliph Muawiya. The Sunni/Shiite split became definitive and permanent when Ali’s younger son, Husayn, was killed in the Battle of Karbala in 680. After the beheading of Husayn, the Shi’ites continued a succession of Imams, members of Muhammad’s household and his prophetic heirs. Each one in turn, over two centuries, was poisoned on orders of the Sunni caliph. According to the traditions of Twelver Shi’ism, the official religion of the Islamic Republic of Iran, the twelfth of these Imams, a boy of 4/5 years old, disappeared. The core of the Shiite religious world view is the Hidden Imam, Muhammad al-Mahdi, "The Guided One." While the stories of the first eleven Imams are historical in nature, the history of the twelfth Imam is mystical and miraculous. Born in 868 AD / 255 AH, Abu'l-Kasim Muhammad (which is the name of the Prophet himself), and when Hasan al-Askari, the Eleventh Imam, died in 874 AD / 260 AH, the seven year old boy declared himself to be the Twelfth Imam and went into hiding. The Shiites believed that he hid himself in a cave below a mosque in Samarra; this cave is blocked by a gate which the Shiites call Bab-al Ghayba , or the "Gate of Occultation." This is one of the most sacred sites in Shi'a Islam, and the faithful gather here to pray for the return of the Twelfth Imam. The central Shi'a doctrines revolving around the Hidden Imam are the doctrines of Occultation (Ghayba ) and Return (Raj'a ) . The Doctrine of Occultation is simply the belief that God hid Muhammad al-Mahdi away from the eyes of men in order to preserve his life. God has miraculously kept him alive since the day he was hidden in 874 AD / 260 AH; eventually God will reveal al-Mahdi to the world and he will return to guide humanity. This return is the most significant event in the future for the Shi'ite faithful and has thunderous eschatological consequences. This return will occur shortly before the Final Judgement and the end of history. Imam Mahdi will return at the head of the forces of righteousness and do battle with the forces of evil in one, final, apocalyptic battle. When evil has been defeated once and for all, the Imam Mahdi will rule the world for several years under a perfect government and bring about a perfect spirituality among the peoples of the world. After the Imam Mahdi has reigned for several years, Jesus Christ will return (raj'a ), as will Husayn and others. It is the return of the dead that falls under the Doctrine of Return; the Mahdi will only appear to humanity. The world, for the Shiite, is a deeply immoral, degenerate, and corrupt place; these are the necessary preludes to the appearance of the Hidden Imam or Mahdi. Like Christianity, Shi'ism is also a deeply prophetic religion. Like Christian belief, the end of time and the appearance of the Mahdi will be preceded by a number of events foretold in prophecy. Like other Abrahamic religions, Islam also teaches resurrection of the dead, a final tribulation and eternal division of the righteous and wicked.Islamic apocalyptic literature describing Armageddon is often known as fitnah, malāhim, or ghaybah in Shī‘a Islam. The righteous are rewarded with pleasures of Jannah, while the unrighteous are tortured in Jahannam. There are two main sources in Islamic scripture that discuss the Last Judgment: the Qur'an, which is viewed in Islam as infallible, and the hadith, or sayings of the prophet. Hadith are viewed with more flexibility due to the late compilation of the traditions in written form, two hundred years after the death of Muhammad.The concept has also been discussed in commentaries of Islamic scholars such as al-Ghazali, Ibn Kathir, and Muhammad al-Bukhari. The hadith describe the end time with more specificity than the Qur'an, describing the events of al-Qiyamah (Resurrection) through twelve major signs. At the time of judgment, terrible corruption and chaos will rule. The Mahdi will be sent and with the help of Isa (Jesus, re-imagined, as in Sunni Islam, as a Muslim prophet), will battle Masih ad-Dajjal (evil). They will triumph, liberating Islam from cruelty, and this will be followed by a time of serenity with people living true to religious values. However, there is no mention of the advent of Mahdi and Isa in one era in any of the hadith. Some Muslim scholars translate the Arabic word "Imam" as "Mahdi" to prove the advent of Mahdi and Isa in a single era. People will compete in the construction of very tall buildings. The Romans (Christians and the Western world) would form a majority amongst people. The false messiah, Masih ad-Dajjal, shall appear with huge powers as a one eyed man with the other eye blind and deformed like a grape. He will claim to be God and to hold keys to heaven and hell and lead many astray, although believers will not be deceived.His heaven is the believers' hell, and his hell is the believer's' heaven. The Dajjal would be followed by seventy thousand Jews of Isfahan wearing Persian shawls. The return of Isa, from the second sky to kill Dajjal. Now all post-colonial boundaries have collapsed. Pakistan acts freely in Afghanistan, as Turkey does in Iraq and Syria. Kurds have run away from Iraq to form an autonomous region and protect themselves from yet another ISIS slaughter. Iran is integral to this widening gyre of geostrategic free fall - not above it. And as always, the Shiites and Sunnis kill each other. A Muslim ruler must stand out and rivals must unite against the common enemy, and then the invasion of Europe is possible as Nostradamus predicted writing about a new Anibal or Arab prince. Yes, a new Persian Empire or Carthaginian empire against European civilization but without the Iranian leadership. Iran as a fragile and internally unstable Islamic republic, has systematically and consistently spread its sphere of influence in a region where national boundaries mean very little but is a deeply flawed, menacing, and malfunctioning Islamist theocracy. Iran has an area of influence but Iran can not go beyond.Iran must be submitted and so the Muslims will be able to be invincible until the arrival of the King of France. Next: the episode of Carmania or the Strait of Hormuz by the tiger of Hircania. 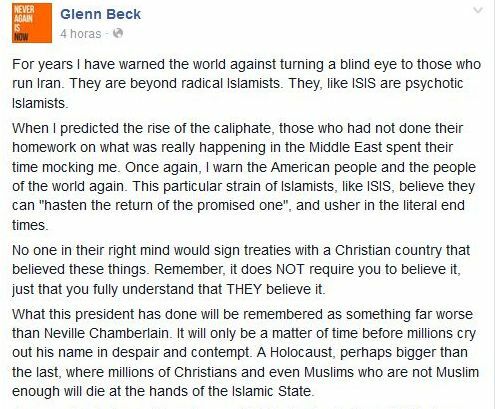 "End Time#Islam" and "Islamic Eschatology"
The scene was set for a titanic struggle, the unstoppable force meets the immovable object! What really happened was another demolition job!